Achieve perfect ambience with professional retail lighting to make the best first impression. Create different scenes focusing attention on various details with accent lighting, RGB colours and tunable white technology via a customised user interface. Re-design the shop window lighting as needed, with just a few touches. Light and the use of lighting effects fundamentally affect our perception of a space, thus understanding light and psychology is key in retail lighting in order to increase sales. Use lighting effects that guide the customer’s perception, present a story, and highlight exclusive product details. Light sources with CRI 90+ show the truest and best look of the goods. In combination with dynamic lighting, you will attract 25 % more people to the store, which can significantly increase the revenue. 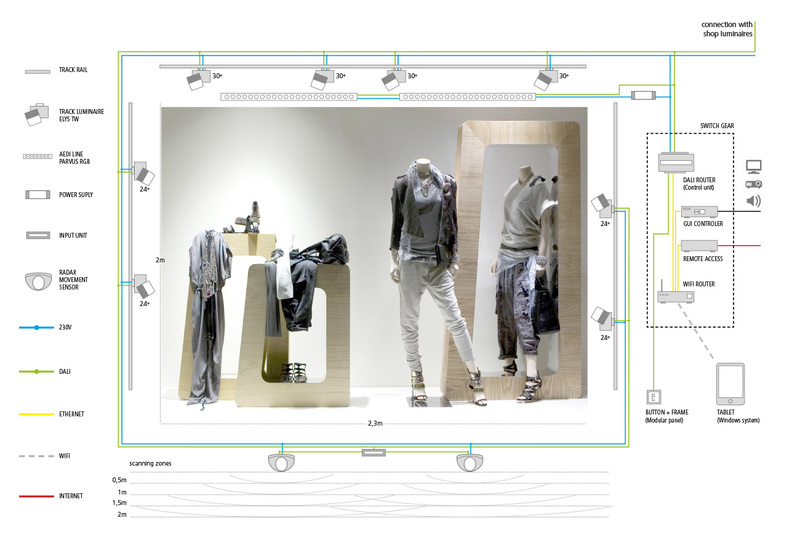 Stores constantly update their range of merchandise and their displays, meaning that shop window lighting must be highly flexible and adaptable. This is achieved easily with LED technology that provides various colour temperatures with the same lighting fixture. Take full advantage of all aspects of your shop windows – simply stand in front of your shop window, experiment, see lighting effects in real time and combine them as you wish.The lighting system is controlled through the Graphical User Interface that is customised according to the design of the shop window. It can be used easily on smart phone or on iPad, with features like adjusting light intensity, changing the colours of the background lighting (RGB), selecting which luminaire is on in each scene – giving focus to different details of the display. Choose different CCT to have warm or cold white light in the window. Harmonise the lighting with the display: set up different scenes and save them for easy interchangability. Using tuneable white technology allows retailers to adapt the intensity and colour temperature of the light according to the colour of the goods displayed in the shop window. Colour-changing RGB luminaires provide different background colours to create the perfect window lighting experience. In addition to the professional lighting design, motion radar sensors are built-in to provide real-time response. The motion radar, with 2 metres range, activates the system when detecting movement. Then pre-programmed lighting scenes alter responsively, providing a high level of interaction with customers passing by. The GUI controller is supported by a router system, while its Ethernet (TCP/IP) backbone allows the control of the lumiaires. 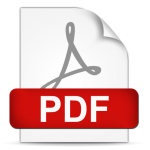 The control unitsupports two-way interaction with serial and networked devices. It communicates with the user interface. 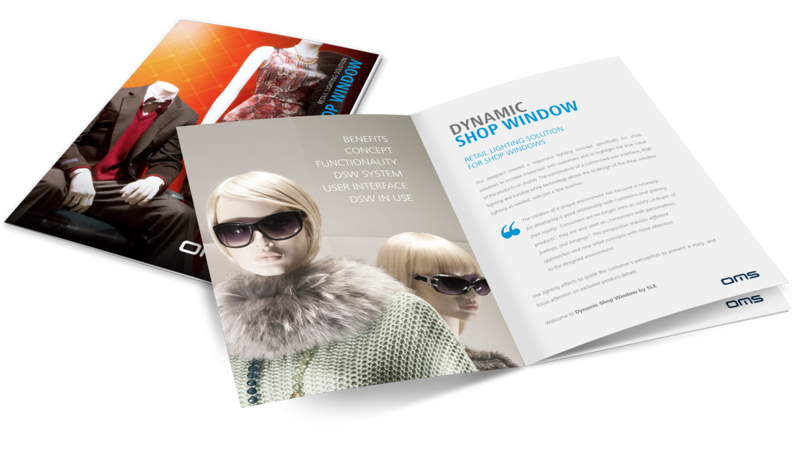 Download the Dynamic Shop Window Solution brochure to see how you can create a stimulating, vivid and captivating shopping experience for every customer. Read about the concept, its benefits, how the customised user interface works and the system behind the lighting solution by OMS. The Dynamic Shop Window is a high-end innovation with user-friendly control which allows you to re-design your display window lighting easily by yourself. Innovative Dynamic Shop Window solution for retail is compatible with the latest metric systems which allow to measure and analyse customer behaviour. Subsequently, the store can upgrade its layout and appearance, its range of products and services, optimise its philosophy, and eventually increase sales and nurture client loyalty. Metric systems installed within lighting is a brilliant idea as it combines the power of each tool into one powerful goal all retailers dream of: know all about the customers and use the data to sell like never before.